This tile reducer will help make a floor transition from 1/8" to zero. 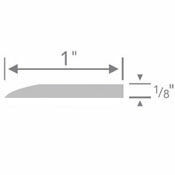 The tile reducer spans 1" and is sold in 3' sections. Made of a 1 piece molding, this floor transition strip is sturdy enough to stand up to heavy traffic. The application of this rubber tile reducer is to provide a smooth transition between to flooring heights while having a slip resistant surface. This reducer is compliant with the American Disabilities Act. Install this tile reducer with Dap Contact Cement for a secure attachment. Maintenance of this floor transition piece is easy, just use mild soap and water. Choose the tile reducer color hue from 4 popular color families to have a match that works with your home or office decor. 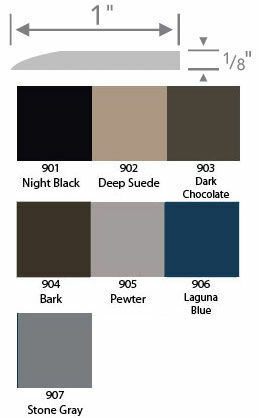 Find the floor transition in night black, light and dark gray, various shades of brown, and laguna blue. Color sample is shown at the bottom of this webpage. When ordering you will need to take in account all computer screens will show colors slightly differently due to individual screen settings. Please contact us with any questions regarding color. Floor transition takes gauge from 1/8" down to 0"
Buy from the flooring experts. Order today.